Are your investments making money? Have you been investing efficiently? Are you accumulating critical retirement assets? Are you achieving your ultimate financial goals? If you have answered yes to these questions, then it is because you’re likely on a solid financial ground or drawing a hefty income. However, you need to pay attention to what you owe back to IRS by way of capital gains taxes. Sometimes the value of your investments such as stocks, bonds, real estate, cars and other tangible items at the time of selling exceeds the value when you bought it. At such times, you incur capital gains taxes. 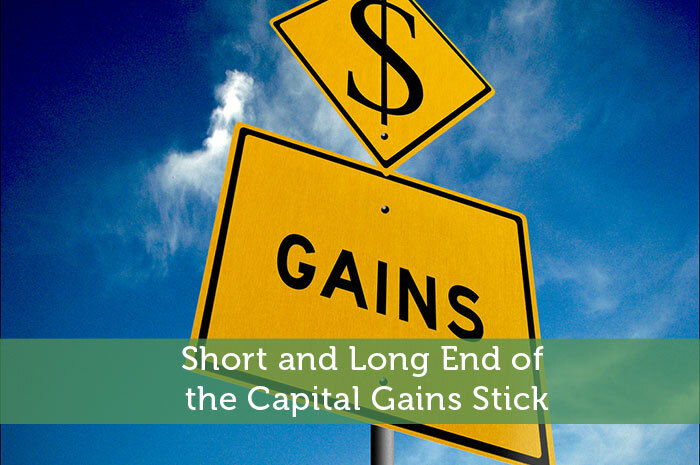 These vary dramatically between short- and long-term capital gains i.e. it depends on the amount of time you own the asset. The longer the period, lower the capital gains tax rate. If your investments in assets have paid off over the course of a year or more, it is termed as long-term capital gains. You may not get to keep all that profit because of long-term capital gains tax that can go up to 20%. But taxpayers whose ordinary tax rate is less than 15% do not have to pay anything by way of capital gains tax. Even those in the highest income tax bracket pay no more than 20%. Value gained from investments held for a year or less is called short-term capital gains for which the tax rate could be in the range of 33% to 40% for high earners and 25% to 28% for low-earners. Short-term capital gains tax is the same as the ordinary income tax rate, and it can range from 10% to 40%. In other words, the short-term capital gains tax rate is based on your income-tax bracket. Long- and short-term capital gains tax rates apply to most assets. However, there are some noteworthy exceptions. Long-term capital gains on “collectible assets” such as antiques, precious metals, coins and fine art are taxed at 28% while short-term gains tax rates are still the same as ordinary income tax rate. The IRS has provisions that can help taxpayers avoid capital gains in certain situations under predetermined criteria. Here are some such cases. Homeowners can avoid capital gains on home sales provided they owned and used it as their primary residence for at least two years in the 5-year period leading up to the sale. Additionally, no home should have been excluded from capital gains in the 2-year period before the home sale. If the rules are met, up to a maximum of $250,000 can be excluded in capital gains for single people and up to $500,000 for married people filing jointly. Dividends tax rates are the same as capital gains tax rates. The best way to minimize taxes on them is by rebalancing, i.e., by putting the money into the underperforming investments rather than reinvesting them in the investments that paid them. Investments within retirement account such as 401(k) plans and Roth IRAs grow tax-deferred or tax-free. That means they do not incur any capital gains tax provided certain rules are followed such as holding the account for more than five years and not withdrawing proceeds until the age of 59 ½. The difference between capital gains and capital losses is called “net capital gain.” Offsetting capital gains with capital losses is another way to avoid paying capital gains taxes. If the investment losses exceed the gains, then up to a maximum of $3,000 can be deducted from the tax return. IRS allows any losses more than that to be carried over into future years. Tax-loss harvesting is a very successful strategy. It is always advisable to hold on to your investment for at least a year to preserve as much of your profit as possible and keep more money in the pocket. Hanging on to growing stocks over many years is a surefire way to build great wealth. Selling them short generates higher tax rate and commission costs. Long story short, long-term capital gains tax rates are significantly lower for most assets. As long as my adjusted income is within the 15% tax bracket (MFJ status), qualified dividends are tax free? Does the amount that goes towards the high end of the 15% bracket include divided income also? What that means is if the high end is $74,900, and my reserved income is 74,900, I have $2,000 in qualified dividends, would the dividend income put me in the next bracket, causing me to pay taxes on the dividend income? With no other incomes you could be making $74,900 in dividend income and pay $0 in taxes, yes.